Hey. I have decided to drop my frame and make everything right. I saw these, http://www.globalwest.net/chevelle-el-camino-malibu-monte-rear-frame-support-1973-1974-1975-1976-1977-global-west.html and I thought to myself, "Self, you can just make that out of 1/4" steel an weld it in yourself". Anyone ever done this? In the description it says some big block cars came with a stamped piece on the frame doing this. If you have the tools and skill, these are pretty easy. These have a tube for a longer bolt, but I have seen others that just use a tab to weld the brace tube on so you don't have to use a long bolt. 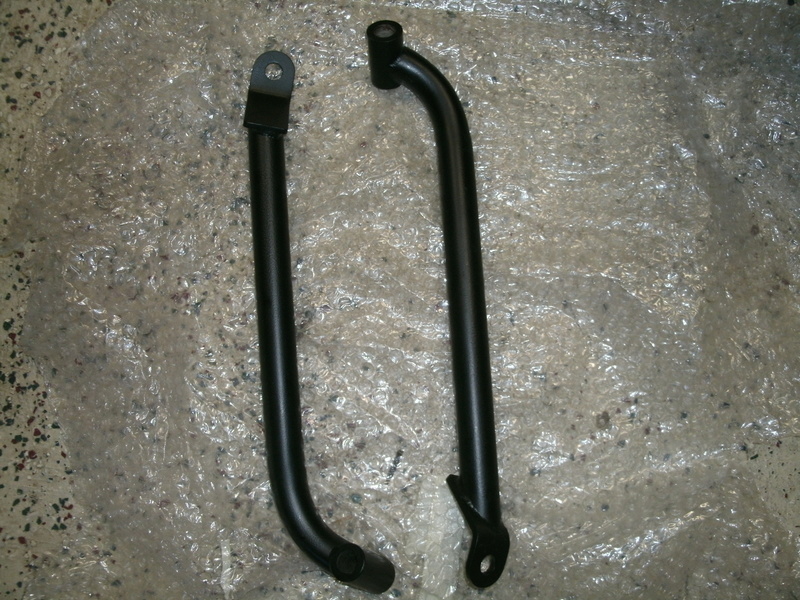 I believe the tab style requires bending the tube a little to clear the floor pan very much like the factory style brace. I bought the global west and ended up returning them. I also purchased the PMT version that had a bend to them. Neither lined up perfectly to my liking. They would work but I decided to give D ick Miller Racing a try. Their bars fit like a glove. I have also seen people weld in a flat piece of steel on the top plate of the foward mounting point for the lower control arm. That is a weak spot on our frames. I've ripped mine off several times. I'm hoping not to do that again especially with the edit Miller bars. The red bars in my pic are the PMT. The installed black ones are the Di ck Miller. I have the Global brand in my '75 Elco. Only used them because my engine is a torque monster, even though not a high HP engine.. Looking at the rear cross member arrangement I can see that they could help brace that area..
Hey Joe, thanks for the old link. I just read the entire thing. I might pull dickmillerracing into the discussion. Or, I think I can make my own and weld up around the torque boxes and around some of the seams. I looked at my spare frame for awhile today and I see some room for improvement. I think I am also going to weld a little boxing into the mid section of the frame where it has the long open channel. These frames are pretty strong compared to a G body. I would definitely make some sort of bar like the edit miller. 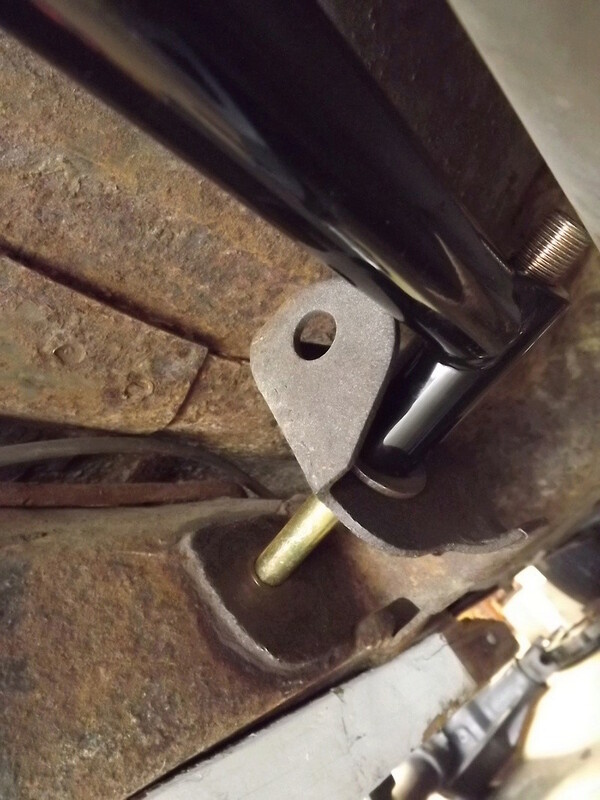 That rear crossmember that the upper control arms bolt to is real flimsy. The bars "triangulate" the rear frame which I think really helps. I remember back in high school where guys with previous generation A bodies also had some issues with that crossmember. Since GM triangulated that area on their high horsepower cars, it must help. And I've ripped the lower mount, I dont want to go through that again. I'm going to give the global west a try. Looks like they re-designed them and lowered the price at summit. Took advantage of the nice weather today and pulled the rear end out. Great time to try them out. My thoughts as well. I have my LS7 for my Camaro project for sale right now. If that sells I am going to get everything Global West makes and go from there. If it does not sell I think I will still buy everything they have for the rear and do the Del A Lum busings in the front control arms. As well as the the frame braces, I added some gussets to the rear upper control arm mounts, and to the front lower control arm mount area. I figured it couldn't hurt to have a bit more beef to where the control arms transfer the load to the frame etc..
Joe73 wrote: They would work but I decided to give D ick Miller Racing a try. Their bars fit like a glove. X2 on DMR. I installed them too. Fit like a glove. REVINKEVIN wrote: I might pull dickmillerracing into the discussion. Definitely recommend DMR vs Global West. Global West bars do not triangulate the Rear Upper and Lower arms....both areas are reinforced with DMR. 73ss wrote: I'm going to give the global west a try. My DMRs were delivered today. What length bolt is necessary now? If I was running a small block Chevy, I would not have used those. Big block guys should really use them, one type or another.. I have a small block manual and I'm going to be running them. I ripped the lower control arm perch off the frame a couple times. Dont want to do that again with the new frame. And that was stock 3.42 gears. zot wrote: My DMRs were delivered today. What length bolt is necessary now? 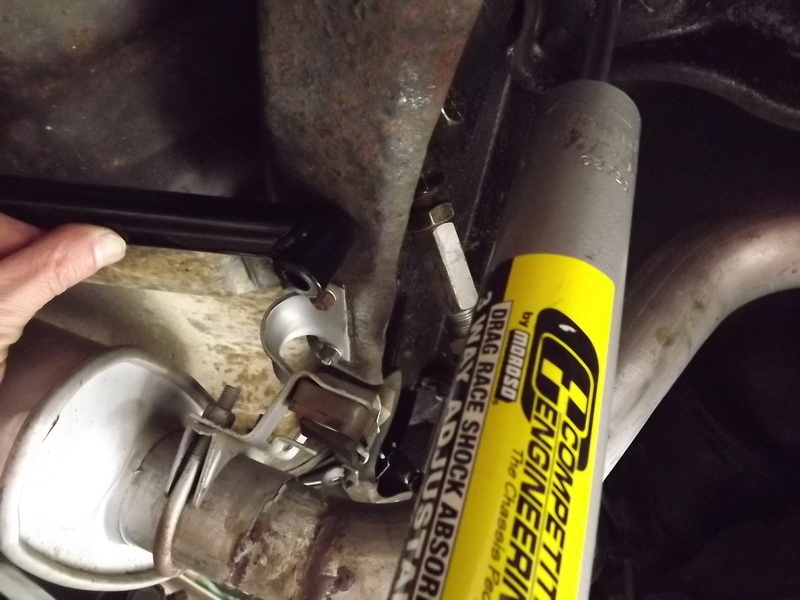 For the side that connects to lower arm.....you will need a 6" bolt (4" is stock length). Does that sound right Joe73? pila wrote: If I was running a small block Chevy, I would not have used those. Big block guys should really use them, one type or another..
That depends on how Nasty is that Small Block. I agree. I think another part of it is having a manual trans car. The "hit" on the rear axle when you dump the clutch is huge. A trans brake car (or even power braking) "preloads" the driveline. Thats another reason they dont recommend using drag radials on a manual car. Unless its a track car of course. You will need a longer bolt on the upper as well. Joe73 wrote: You will need a longer bolt on the upper as well. The upper bolt for my car was replaced when the 12 bolt was installed, so it was already longer. Thanks! I can't wait until I get it all together. I got a set of the global west. Probably should have listened to you guys. Un-like the ones Joe has pictured. You need to drill a hole in the rear cross-member to mount them. Not a big deal but I thought the whole idea was to keep the upper mount from ripping out? They will not clear the e-brake cable mount without a spacer or grinding. This area looks tight in the pics Joe put up of the DMR's. The pics are driver side. Pass side won't clear the muffler. Not to sure whats going on there. Muffler is closer to the frame buy an inch. Not really wanting to mess with the exhaust. I've got quite a bit of time & money in it. I figured I would give these a try. I'm 5-min from summit racing and had some summit bucks to spend. Nevermind my highly detailed floors in the pics. No issue with a washer or two to get it away from the e brake bracket. But I was not a fan of drilling a hole in the rear cross member. I wanted to go with the upper control arm bolt for the most triangulation and strength. Thats why I returned those bars. The Global West Bars do nothing for the upper arms. DMR Bars fit like a glove on my car (76 Malibu). 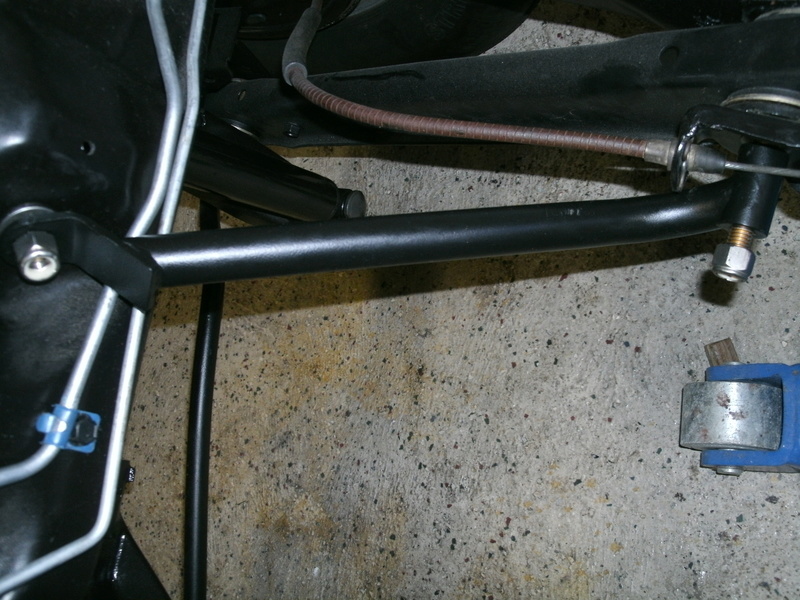 I know that some folks had the control arm mounts torn loose at the frame, and maybe the cross member, so when I did my chassis, I welded gussets on the attach points of the control arms, on the frame, and on the cross member. Of course it wasn't difficult on a bare frame without the body on it..
Joe or anyone, did you have any muffler clearance issues with the DMR bars? where they attach to the lower control arm? I have a X pipe and just noticed it is offset to one side. Pass side bar wont fit. Hits the muffler where the bolt comes through. My last pic is of the driver side. Just wondering if the DMR bars are the same in this area. 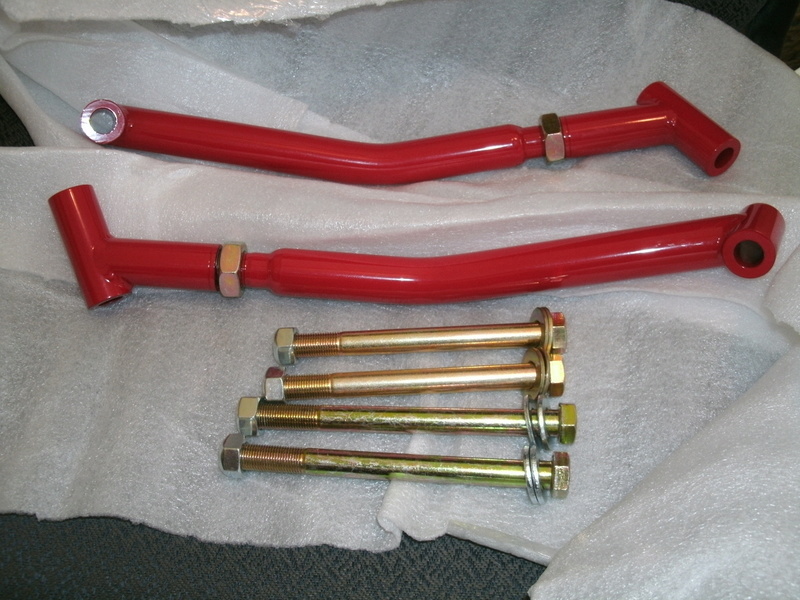 I dont have mufflers in my car yet (actually no engine either) but I was concerned when I installed the bars. I dont think I will have any issues with muffler fitment especially because aftermarket mufflers are quiet a bit small than factory mufflers. That was another reason I returned the Global West bars. 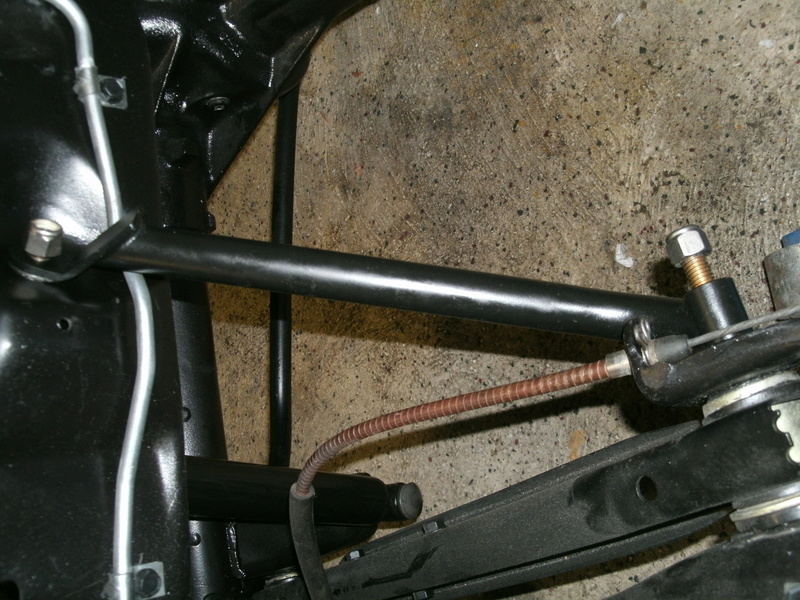 Since the global bars bolted to the bottom the rear crossmember they are actually lower than the DMR bars which bolt to the upper control arm. I honestly dont know how Global West came up with the idea to bolt the braces to the bottom of the crossmember. Its a wimpy piece of stamped steel.